RITA: You're missin' all the fun! These people are great! Some of them have been partyin' all night long! They sing songs 'til they get too cold and then they go sit by the fire and they get warm, and then they come back and sing some more! PHIL: Yeah, they're hicks, Rita! He is eager to advance in his career so he never has to return. However, some supernatural agency intervenes and forces him to relive the same day in Punxsutawney, over and over again, until he learns a kinder outlook. There is a striking similarity between Phil Connors at the start of the film, and Hillary Clinton. I'm thinking in particular of Clinton's infamous remark, that half of Trump's supporters were in the "basket of deplorables". Which half is that, Secretary Clinton? Punxsutawney is a real place. It's located in Jefferson County, Pennsylvania, which is a strongly Republican area. In 2016, 78% of Jefferson County voted for Donald Trump, and 19% for Clinton. If we take Clinton literally, four in ten people in Jefferson County are deplorables: Consumed with hate, unfit for polite society, unworthy of any attempt to communicate. I have no doubt Jefferson County has its share of racism and bigotry; but it is ridiculous to dismiss nearly half its people like this. It is, frankly, un-American. If the ideal of America means anything, it means everyone is an equal citizen, with a stake in the future of a shared nation, and a responsibility to help decide that future. Most people in Jefferson County voted for Trump. That is their responsibility. I firmly believe it was a mistake; but it was not a crime, let alone an unforgivable sin. Jefferson County has been Republican for some time. It heavily favoured Romney over Obama in 2012; but the margin was significantly less, at 72% Romney, 26% Obama. Clinton got 1098 fewer votes than Obama in 2012. Trump won the entire state of Pennsylvania by less than 70,000 votes, so this really matters. The potential Democrat voters of Jefferson County have a lot more in common with the so-called deplorables than they do with Hillary Clinton. She's fantastically wealthy and well-connected, and spends her time globetrotting between the richest cities in the world. They're ordinary people, living ordinary lives, in an ordinary town; one we'd never have heard of, if it wasn't the setting for a quirky Hollywood comedy. The so-called deplorables are their friends, families and neighbours. If you take someone off the street in the real town of Punxsutawney, there's an excellent chance he or she voted for Trump. There's a lesser, but far from trivial, chance this person might be willing to vote Democrat next time. You can't tell by looking; deplorables do not bear the mark of Cain. The only way to find out is to talk to them. As Clinton discovered, lecturing them from on high is a poor substitute. The film was made in 1993. A lot of people who were in Punxsutawney then are still there, twenty-four years later, having watched small towns lose jobs and their standard of living go downhill. A lot of them would share Ralph's gloomy agreement with Phil. Trump at least promised to make them feel like they mattered. Of course that was all smoke and mirrors, but it still got their attention. Clinton didn't offer much in the way of meaningful change. She was very much the continuity candidate. For places like Jefferson County, her campaign was uninspiring at best, insulting at worst. Clinton had her positive qualities; but she was so arrogant and remote, flimsy promises from an obvious con-man were enough to take her down. 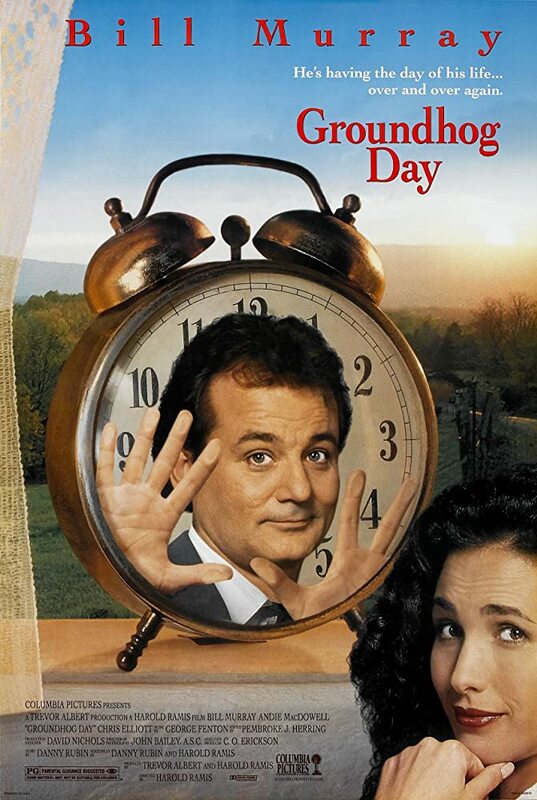 I'm well aware that Groundhog Day is fiction. The real Punxsutawney wasn't exactly like the film version in 1993, and it certainly isn't now. But we can learn from it: Phil badly needed to relate to the citizens of Punxsutawney as human beings, not as hicks whose existence had no purpose but to further his career. The Democrats must learn the same lesson, in relation to Punxsutawney and a thousand other towns like it. They need to learn it quickly and well, because now it is their duty to resist Trump. They cannot afford to write off large sections of the country; that is exactly what allowed Trump into power in the first place. Resistance to Trump must not fail; because while few of his voters are truly deplorable, the man himself most certainly is.